The May forecast is fast-approaching. It is the single most important thing our office does, as it effectively sets the revenue estimates and kicker baseline for the upcoming biennium. This week and next we are meeting with our economic and revenue advisors to discuss the outlook and pick their brain for insights into their industries, what their clients are seeing, and the like. Right now, however, I wanted to review where the economic outlook stands today. This may change somewhat after our advisory meetings and as we finalize the May forecast. Overall, our office is expecting slower economic (and revenue) growth moving forward than what we have seen in recent years. This largely stems from the fact that the economy is currently somewhere near full employment. The unemployment rate is at historic lows. Even if you add back in all of those who probably should be in the labor force but are not looking for a job today, the labor market is tight. Those working part-time but want full-time work is also back down to pre-Great Recession rates. And importantly, the share of the prime working-age population with a job is also back to where it was in 2007, more on this soon. As such, job growth in the past year has slowed. 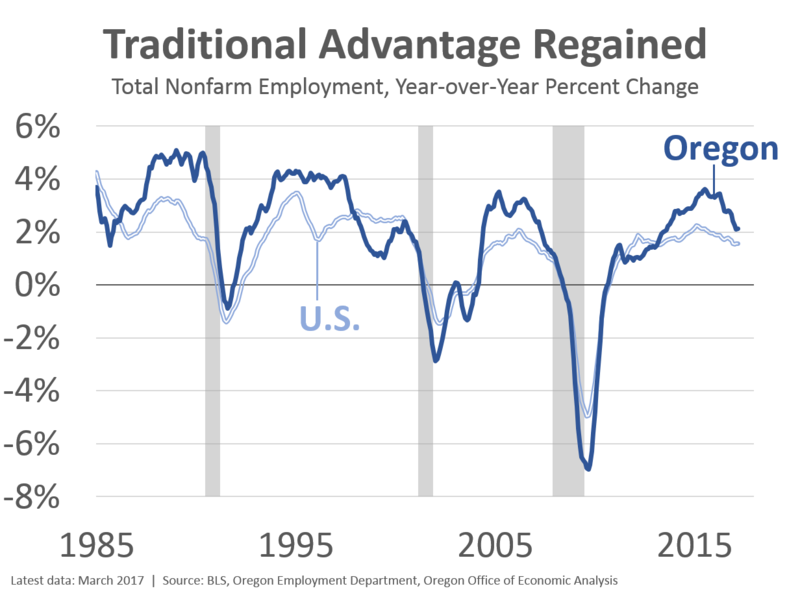 We are past the cyclical peak seen a couple years ago when the state was adding 5,000 jobs per month and seeing growth rates of 3-3.5% year-over-year. Right now, we are seeing gains of closer to 3,000 jobs per month, or rates of 2-2.5% year-over-year. This is largely in-line with our office’s forecasts and what Oregon needs to keep pace with the growing population. Remember, an economy approaching full employment behaves and grows differently than one digging out from a recession. This relative slowing in job growth is essentially across the board. It is not just one or two industries weighing on the topline. Two-thirds of employment subsectors are seeing slowing growth. Given tax revenues largely track the economy, expectations for slower job growth translate into slower revenue growth as well. I think this point gets lost in the current budget discussion at times. Of course it is not lost on legislators and budget writers who ask us about this. However, this relative slowing amounts to hundreds of millions of dollars. Depending upon how one extrapolates recent trends, the projected budget hole would be 20 to 40 percent smaller if growth in 2017-19 matched what we have seen in 2015-17. Now, since 2012 our office has built in this economic and revenue slowdown starting in about 2016. At this point in the business cycle, and with the economy near full employment, it is hard to forecast growth rates to re-accelerate and match those seen a couple of years ago. Importantly, these forecasts have also largely tracked well. That said, they have not been perfect. We had a relatively small kicker in 2013-15, but a kicker nonetheless. We are certainly not yet out of the woods on any potential kicker in 2015-17 either. As such it is important for us to gather input from our advisors as we work to hone our estimates for the upcoming biennium and release the official forecast on May 16th. Josh – great info as always. Do you somehow factor in National policy changes? The Feds seem to be in such flux that I would think that would impact us sooner or later. Thx. Hi Kevin. Thanks for the kind words and question. Locally, it’s easy. We do a current law forecast. So what’s on the books here in Oregon is built into the outlook. For federal policy it’s a bit harder and more indirect. We use IHS Global Insight for our US outlook data (IHS and Moody’s are the two largest, most common US macroeconomic vendors). IHS builds in some policy assumptions and lets us know what they are. It’s a bit hard to deconstruct the economic impact of each policy, however. Right now this is OK, even as you note the uncertainty is large. The reason is due to just looking at the economic forecast data and ignoring the rhetoric around it. This is true for IHS and the consensus of forecasters (I tend to look at the WSJ survey). Since the election, forecasters have been talking about the impacts of certain policies, and a near-term boost to growth, etc. But if you look a their actual forecast numbers, they haven’t changed much. A slight increase — 0.1 or 0.2% in GDP growth, or employment growth — but not much. Now that we have seen very little actual policy passed, forecasters seem to be backing off the rhetoric, but they’re not backing off their forecasts since they didn’t change much in the first place. That’s been an interesting development to watch. So to get back to your question, there are some federal policies embedded in the US outlook we use. This includes reductions in both personal and corporate tax rates (not a lot of base broadening, but statutory rate reductions), and a small infrastructure package. Not a ton of stuff. Our office is waiting to see what actually gets passed before we explicitly look into putting any impacts in the outlook. We’ve talked about it with advisors, but not putting (revenue) impacts in the outlook just yet.